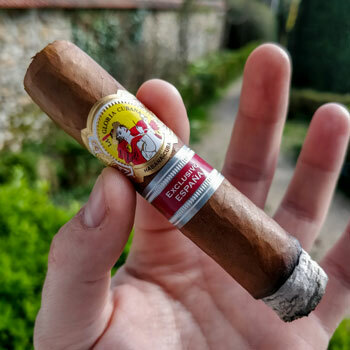 Following our review of the Ramon Allones Superiores, we continue our exploration of Cuban cigars with La Gloria Cubana’s Serie D N°5 2017 Exclusivo España. Indeed, another limited release from a renowned albeit not superstar brand, I’m looking forward to sampling it. You can use the links above to jump ahead or scroll down to learn more. Following Italy, the Exclusivo España is La Gloria Cubana’s 11th Edición Regional release. Named after the Partagás vitola, the Serie D N° 5 is a chunky 4 1/3 x 50 petit robusto. Buy La Gloria Cubana Serie D Now! When first opening the box, the ten modest cigars release bracing notes of barnyard and cocoa. Picking one out at random, I take a close look at the wrapper. The Serie D N°5 features a clear, cinnamon brown wrapper with a slight reddish hue. Free from any blemishes, it’s somewhat soft when pinched with a mostly even yet slightly bumpy consistency. From the body, the cigar mostly diffuses barnyard aromas with a hint of ammonia. Meanwhile, the foot reveals notes of chocolate, spicy cinnamon as well as some gourmand vanilla. As per usual, three La Gloria Cubana cigars were smoked for the purpose of this review. In smoking several, I was able to identify any reoccurring issues as well as provide a full picture of the overall experience. With a quick snip of the head using the la Gloria Cubana Society cutter given to me by Paul Anthony, I tested the cold draw. Surprisingly for a Cuban, the cigar only gives minor resistance and the draw is very nearly loose. In terms of flavour, it was reminiscent of the foot’s aromas with additional notes of cedar, metallic copper and earth minerals. Meanwhile, there was a slight citrus element with hints of gourmand sweetness. Opening with a surprisingly fuller body than expected as well as considerable complexity, the first third’s bouquet is largely dominated by a discreet roasted coffee bean bitterness. On the retrohale, there are hints of dark chocolate with the refreshing zest of charred pine cone. The overall bouquet is mostly earthy with some gourmand elements. Meanwhile, the palate is largely stimulated at the front as well as the lateral front, which results in a somewhat drying and astringent smoke. The second third emerges almost instantaneously with very little warning. There are few transitional notes and the cigar mellows almost between draws. Distancing itself from the earthy profile, the Serie D’s second third places much greater emphasis on spice. Although gourmand chocolate dominates the overall profile, a strong portion of cinnamon tingles the lips and the tip of the tongue. When retrohaling, hot paprika fills the nasal cavity and caresses the back of the throat. While the tongue stimulation still concentrates near the front of the palate, it has slowly edged further back up the tongue. The astringence of the first third is now relieved by some modest salivation. La Gloria Cubana Serie D N°5’s final third is arguably an entirely different cigar from the initial experience. An entirely unexpected finale, the cigar produces thick, charred notes that almost overwhelm the senses. A dense leather note dominates the final third with an unctuous texture. Notes of charred oak as well as only murmurs of the second third’s spice follow shortly after. Pepper with a metallic finish can be experienced in the retrohale, which offers a bracing sensation. As for the tongue stimulation, it now races straight up from the tip of the tongue to the back and can be felt mostly on the rear of the palate. At first, La Gloria Cubana Serie D N°5 offers an exemplary burn with a clean, white ash. However, after a few centimetres, it tends to burn sporadically. Although I usually refrain from touching up a cigar as I prefer to experience it naturally, it often needed one by the second third. Nevertheless, the ash backbone held well and produced a lengthy stack. Yet this was often lost after touching up. Still, it produces a pleasantly cool smoke with an excellent draw that provided just the right level of resistance. Being effectively a shortened robusto, the Serie D is a relatively brief smoke. In most cases, it lasted around an hour. However, I could easily push this up to 70-odd minutes with contemplative smoking. As a delicate smoke that crescendos as you progress, the Serie D is best accompanied with discreetly characterful beverages. I initially reached for a very hoppy Inferno by Oakham Ales. However, I quickly realised that this wasn’t most appropriate refreshment even if it could have worked relatively well with the first third. Instead, I opted for the Caol Ila edition of Hepburn’s Choice single malts. A zesty peated whisky, it proved to offer the best contrast and overall harmony to the smoking experience. Otherwise, I would suggest a very lightly roasted espresso such as Manaresi’s Miscela Oro blend. As a general rule I’d avoid anything to brash or overpowering lest you miss out on the Serie D’s nuances. Gurkha Typhoon Gordito Cigar Review: How Does This Short & Fat One Compare With A Nub? 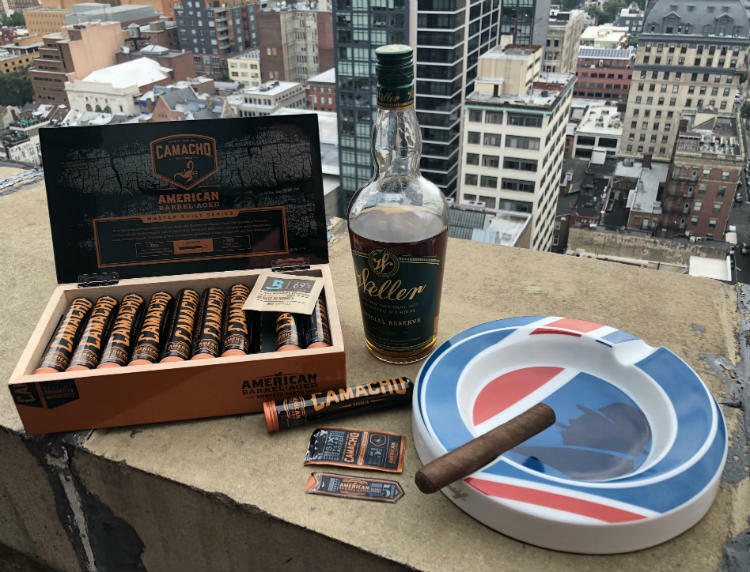 Delivered in a typical cedar box with glued ornamentation, the La Gloria Cubana Serie D is very much the quintessential Cuban. Unfortunately, as it came from Spain, it was plastered in health warnings and my best efforts to remove them only made it worse! The boxes interior features the typical romantic imagery of Cuban cigars with cherubs and the like. There’s also a small sheet in Spanish that describes the blend and its background. As the Serie D N°5 is a limited edition, each box is numbered on the rear. This particular one was number 34,533. Each cigar is decorated with two bands: the main one of the brand as well as the LCDH red “exclusive” label. I’m quite fond of La Gloria Cubana’s band with its yellow background. Indeed, it’s one of the rarer ones that you see these days. As for when I would recommend sampling a Serie D, it’s hard to pinpoint an exact time of day given the distinctive evolution throughout each third. Initially, I would have suggested it for the early to mid afternoon. However, it’s stronger second half would be better suited to the early evening. Nevertheless, this is a great, short smoke to enjoy for special occasions or even with friends. Still, I would certainly consider it for some solitary contemplation. Finally, the Gloria Cubana Serie D N°5 is a limited edition cigar from 2017. Therefore, it can be hard to find and the price has risen over the years. However, it currently sold by Montefortuna Cigars who deliver internationally and retail their boxes for 130€. A deceitful little cigar, the La Gloria Cubana Serie D N°5 is full of surprises. Opening as a mild cigar, it evolves to develop a distinctively full body and rich character. As such, this is an excellent cigar to recommend to seasoned enthusiasts who are actively seeking new experiences. If you’re looking to discover a unique blend that offers a crescendo of flavour, the Serie D is well worth your consideration. "A crescendo of aroma that may surprise you. A cigar best experienced without expectations, the Serie D will reveal some of its most complex and nuanced flavours to patient smokers."